Here we are again with another set of reviews for products available at Love Lula, keep reading to hear my thoughts on the products pictured above. Elsa's Organic Skinfoods Sensitive Deodorant (unfragranced) - up to this point I haven't been using natural deodorants because I've experienced reactions and prefer stick/roll on packaging (many come in jars). I thought I'd have another punt and chose Elsa's Sensitive Deodorant as its a stick applicator, it does not contain sodium bicarbonate (which I suspect irritates my skin) and it's fragrance free (eliminates linalool, one of my sensitivities). I need to hold this deodorant against my underarm for a few seconds to get the product to melt otherwise application drags across the skin. It doesn't always go in my favour on cold mornings and I've experienced mild soreness from rubbing. I'm a delicate flower thanks to all my skin ailments. So far I've found Elsa's deodorant works well throughout the day but I have a desk job so I'm not running around the place. I haven't noticed any bad odours but I guess the ultimate test won't happen until the summer months. At this stage I'd say that Elsa's Organic Skinfoods Deodorant has left me with a good first impression but I'm not ready to ditch my regular deodorant just yet. Madara Cleansing Milk - unfortunately I experienced soreness across my cheeks on more than one occasion so I stopped using this cleanser. I had tried samples in the past without problems so it just goes to show how our skin changes over time. I use Madara hand cream and tinting fluid on a daily basis without any issues so it's just this cleansing milk causing me problems. Stop The Water While Using Me! Cucumber Lime Liquid Soap (200ml) - as the brand name suggests these products are a reminder that saving water is important. Stop the Water created the 'Good Water Projects' and donate a share of revenue to projects that provide fresh and clean water where it is needed most. The cucumber lime soap is suitable for vegans and lime is the dominant fragrance note. It feels nice, lathers well and doesn't seem to contribute additional dryness to my already flaky winter skin. 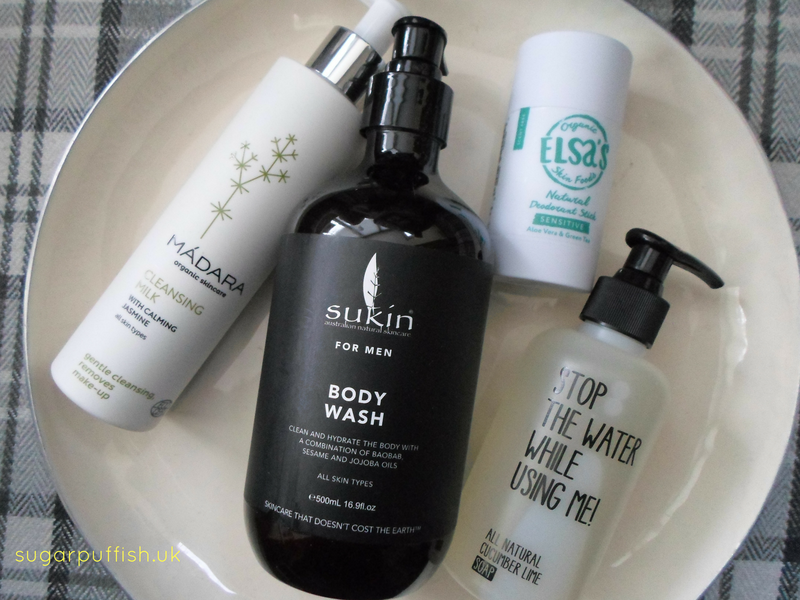 A 200ml bottle costs £14 which is more than I would normally spend on a hand wash.
Sukin For Men Body Wash - I really like Sukin as they offer good affordable options. I selected the body wash for my husband but since it is free from linalool I've been pinching it for myself. On first use I was very surprised by the delicate orange aroma because from past experience natural skincare for men tends to have musky, earthy and strong scents. This body wash lathers up very well with my konjac sponge and feels pleasant on my skin. I could see myself replacing once empty and I wouldn't be put off by the labelling for men, I'd say it's unisex.